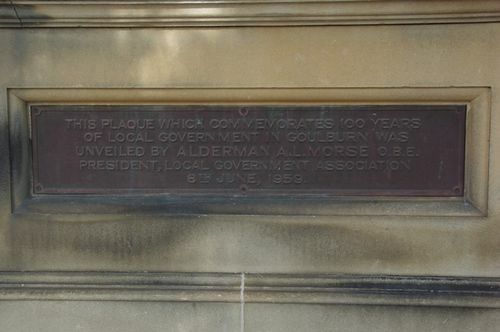 Plaque commemorates 100 years of Local Government in Goulburn. Goulburn was proclaimed a municipal government in 1859 and was made a city in 1863. By 1841 Goulburn had a population of some 1,200 - a courthouse, police barracks, churches, hospital and post office and was the centre of a great sheep and farming area. A telegraph station opened in 1862, by which time there were about 1,500 residents, a blacksmith's shop, two hotels, two stores, the telegraph office and a few cottages. A school was opened in 1868. UNVEILED BY ALDERMAN A.L.MORSE O.B.E.